Christa from Road Runner magazine (a terrific publication, by the way, and if you don’t subscribe you absolutely should) was here a few weeks back and asked me about riding the Mogollon Rim Road. It is a 55 mile forest service road from Forest Lakes to Show Low, AZ and runs 5-10 miles south of Hwy 260 right along the rim. 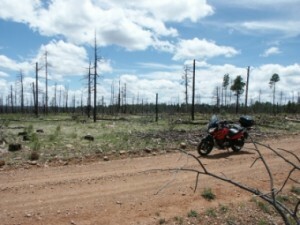 At the time (early spring) reports said it was too damp, too rutted and nasty for motorcycles, so she passed. Best bike for this would be a dual sport oriented more toward off-road. I was on my Wee-Strom and would have much preferred a 1200GS or any KTM. This looks like a wonderful ride, except for the slush. They put down gravel on our road every so often so I know the feeling – for 500 ft. – not 7 miles! I love being out there where nobody is. But a little pavement would be nice.